Description: The "Life is Precious" bracelet takes a stand for Life using the popular rubber-band format (Similar to Lance Armstong's Live Strong bracelets). 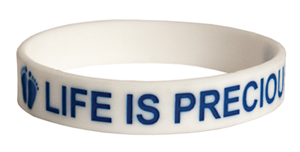 Colored white to be both a symbol of the purity of the unborn child and to stand out from other campaigns, these bands are perfect for starting a conversation about the sanctity of human life. They include the debossed shape and size of unborn baby's feet at 10-weeks old and the words "Life is Precious". They will last for years and fit any teen or adult. Use them as a fundraiser, hand-outs, or just as a conversation starter. Bracelets are 8 inches circumference. The Life is Precious bracelet is one of our many Heritage House giveaways used at the County Fair. Participants play a Right to Life rendition of 'PLINKO' and win a pro life item. The bracelets are a favorite. It's rewarding to see the bracelets on the wrists of the fair goers! I have used these as giveaways for my pro-life booth at my county fair. They were very popular. They are very well made. I wear mine all the time. I plan to give these away at my church's prayer gathering in January for the Anniversary of Roe vs Wade. We have distributed these bracelets at our parish carnival booth for the last 2 or 3 years. They are attractive and durable and are popular with both adults and teens. These are very popular with the youth at our church. I don't find them to be too small at all, either for youths or adults. I like the blue print on the white background. Easy to see the message! We have used these for years at our annual 5K. People love them! I just order this item for Respect Life month to raise awareness among the youth of our church. I work at a Pregnancy Center and we have been giving these bracelets. They are popular and good quality! I have worn this bracelet and found it a great way to spread the message of the sanctity of life. I gave them out at our parish festival also. Very durable. Great for pro-life events and things like cemetery of the innocents. They were also very popular among adolescents. It reminds them of the beauty of life, but it's not an in-your-face way of doing it. One of the most liked items by our prolife activists, children and adults. Great material. Only thing is it doesn't fit men perfectly, more of a woman's size. Love it. These are very popular among the preteens and teens who stop at my booth during our annual fall festival. Our pro-life leader in the community gave me a green bracelet with the same message 8 years ago and I have been wearing it until now. I could not go out the house without this bracelet! A fitting reminder to defend life! I'm ordering this bracelet to share during the 40 Days for Life 2013 Fall campaign. I have one that I have worn for years ... at least 10. It is yellow with age but it is still a conversation starter. These are great! The kids and teenagers love them. They are a great way to spread the message and are a great price! We always keep these on hand for prizes and at fair booths, etc. We have even handed them out at Halloween! They are strong, too, the kids don't tear them out at all. These bracelets are loved by people of all ages. I try to keep a supply on hand to give out to my prolife teen group, and I can't keep them "in stock". The kids always want more to share with their friends! We have used this bracelet at our local county fair booth for the last 4 years. They are a wonderful draw to our booth and conversation starter about LIFE & the significance of the baby feet. These are a staple at our pro-life church events. They last forever, which is great. But they're not as popular as they once were. We are giving these out on SOHL Sunday. People always seem to like these bracelets. We gave these out at the CPC when we would set up booths at the health fairs. Everyone loved wearing them. These are an excellent tool to use to share the pro-life message. Even my husband is wearing one! These are a hit with adults and our church youth. They are given when we have prolife events and are requested by others who envy those that have them. I gave my friend this bracelet, and she loved it. It contains two powerful messages: "LIFE IS PRECIOUS" and the two baby feet, which are great conversation starters. I have several of these that I will pass out at pro-life events on campus, along with the blue PROLIFE bracelets. The price is very reasonable for the quality of the product. We have used these at fairs for years. The youth and adults both love them. I get people to take a prolife quiz by giving them one of these.